join the mailing list to receive updates! Have you ever wanted to get feedback about your photographs? This class is a photographic discussion on a lawn in Central Park. You'll have a chance to see the work of others in the group and to contemplate the meaning and stories in the pictures you encounter. Participants are required to bring two different images, their own work printed on 11x14 paper. At the conclusion of the circle discussion program, everyone will have the option of selling or trading their photographic prints with others in the group. On a summer day, Jones Beach is a busy spot, one of the area's popular waterfront locations with plenty for photographers to focus on - the nexus of land and water, summer crowds and birds in flight, and the strongest patterns of light and dark. This class involves bringing our cameras very close to water's edge, and at times we will also step in, get wet and get the shot! Hop the ferry from Lower Manhattan to Governors Island to explore grassy expanses, older physical structures - former U.S. Army and Coast Guard buildings and two forts from the early 19th century - and impressive views of the NYC skyline, Statue of Liberty and water traffic. Learn more about the photographic techniques best suited to capture the pounding waves that strike at rock and send sprays up high, and best composition choices to document public art sculptures and the people who enter your frame. Young photographers who enjoy photographing animals and people, will enjoy this class at the Bronx Zoo. We'll visit various spots in the 265 acre park over a number of hours, with plenty of opportunity to practice using various camera settings and learn how photographers try to achieve the best picture composition possible in a given situation. The NYC subway remains a key element of our city and the urban landscape, and a topic of frequent conversation. Join Judah S. Harris in photographing on the trains and in the stations, and learn how to evoke some of the subway experience - both the humanity and the architecture. This class is limited to 6 participants. Registration requires permission of the instructor. Please join my mailing list using the yellow sign up box right above, to receive up-to-date information on new classes and programs. Courses are held in Manhattan and occasionally in the other boroughs. An accomplished photojournalist and fine art photographer, Judah S. Harris has spent more than two decades exploring humanity, world destinations, and life's unique moments. 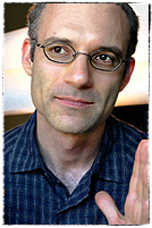 His visual storytelling has appeared in magazines, on the pages of The New York Times, on the covers of more than 40 novels, and in advertising both in the United States and abroad. Profiles about his work have appeared in Shutterbug, The Picture Professional, American Photo, Photo Insider, and various web 'zines, and he has been heard on WOR News Talk Radio. Distinct composition and a strong sense of narrative are two essential qualities in Judah's work, which has been exhibited in gallery and museum settings, as well as on the walls of retail establishments such as Bloomingdale's, which owns 19 large prints of his conceptual B&W and color photography. Judah is committed to education. An inspiring public speaker, he lectures to groups of various ages, leads photography workshops for teenagers and adults, and has taught business and creative marketing to Illustration Majors at the Fashion Institute of Technology in New York City. He offers a range of photo workshops as well as private instruction in photography and, in a related business, provides visual and social marketing consulting for small business, retail shops, boutique hotels and local restaurants, and nonprofit organizations. Join the mailing list (scroll back to the top of the page), to receive updates about new classes. This is the first in a series of explorative Manhattan photo walks led by Judah S. Harris. The itinerary includes Lower Manhattan, Chinatown, and the Lower East Side and offers a special combination of architecture, water vistas, street photography, and Jewish life. Instruction in camera technique and visual composition will be provided along the approximately three-mile route. Here's a chance to really "see" New York! Walk through parts of Washington Heights - with a chance to photograph neighborhood street life, views of the Hudson River, and one of Northern Manhattan's great spots - Fort Tryon Park, with many enjoyable walking paths, stone walls and arches, and a vantage point overlooking the George Washington Bridge and parts of Manhattan and the Bronx. Instruction in camera technique and visual composition will be provided along the approximately two-and-a-half-mile route. Here's a chance to really "see" New York! One in a series of explorative Manhattan photo walks led by Judah S. Harris. The itinerary includes Central Park, exploring both the more familiar open spaces and some hidden spots off the beaten path. Architecture, nature, vistas, and the human element come together in this 843-acre oasis in the heart of Manhattan. One in a series of explorative Manhattan photo walks led by Judah S. Harris. The itinerary includes Washington Square Park in Greenwich Village, up Broadway to Union Square Park, and then on to Madison Square Park. Here's a chance to engage in some serious street photography - documenting people in real situations - and capture compositions of diverse forms of city architecture. Instruction in camera technique and visual composition will be provided along the approximately one-and-a-half mile route. Here's a chance to really "see" New York! High Line Park on the West Side of Manhattan exists on a historic freight rail track built in the 30's, as part of an effort to get dangerous train traffic off the streets of the city. Any visitor who's walked the High Line knows that the array of architecture and views of both city and waterside are unique. The photographic challenge is to organize the elements that present themselves to the viewer, to identify at times simpler compositions, and to document the ever-changing scene as one progresses along the High Line's walking path, which is presently one mile in length. 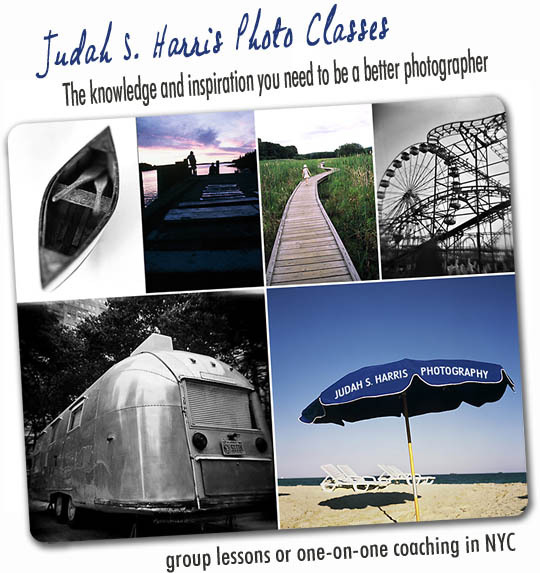 photo lesson or photo walking tour with Judah S. Harris, or join one of our scheduled events. These itineraries offer tourists an exceptional way to to see the city, while improving their photography skills and visual acumen. as well as off-the-beaten-path NYC neighborhoods and locations that even many New Yorkers don't know about. A one-on-one photo coaching session for friends or couples, affords you the opportunity to study creative photography together - what you want to learn, at a time that's most convenient for you. Judah S. Harris plans an itinerary best suited for your interests and level of photographic skill, providing short assignments, technical and creative know-how, and honest critique of your images right on the spot. Students consistently share that they find the sessions enjoyable, entertaining, highly practical, and always thought provoking. Fall in love with a plastic toy camera! The Holga is a popular very affordable film camera with an almost cult-like following that produces non-traditional and uniquely creative results for all its users. It is considered a choice learning and creative tool for visual artists, from amateur to professional. The Magical Holga photography workshop is open to all levels. Designed for serious photo enthusiasts, this walk around historic Kissena Lake in Flushing, Queens provides access to many nature subjects - majestic trees and leaf patterns, ducks, turtles, and migrating birds, or the human element that can be found interacting with the outdoors. Short assignments are given to the group to help improve technique, composition skills, and the use of available light in a more creative manner. What does Manhattan look like at night? Spend a few hours from before sunset till after dark. The city never sleeps - so why should photographers? We'll choose some good locations to explore the night light that pervades the city and discuss how to create compositions with strong mood, and camera settings that will produce best results for night photography. Spend a morning at an Upper West Side flea market searching for objects of interest and doing some people watching. Each participant will work on their own photo essay to portray the diverse aspects of the flea market experience - as they see it. Photo instruction in composition, people photography, camera settings and lens choices, and the art of the photo essay will be provided. Digital photography and the "automatic settings" have made picture taking easier than ever, but the best results come from understanding how the camera functions, and artistic considerations - such as composition, the use of light, and capturing real life subjects - that are essential ingredients for good photography. This class is open to Beginner and Intermediate photographers. Why do many photgraphers continue to use film well into the digital age? Using classic 35mm film cameras and assorted types of roll film, students will gain understanding of the unique textures and visual qualities of film, the mechanics of how all cameras capture an image, and the psychological benefits of working with a limited amount of exposures while engaged in the art of photography. Bring your HD DSLR camera with video capabilities and join the class as we film a variety of brief NYC scenes to create a short collective video for web broadcast. Each participant will submit a handful of their most interesting clips for consideration in a class video to be edited by the instructor. 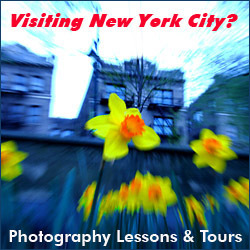 Explore NYC street action, camera movements, focusing, exposure techniques, and lighting. This class is limited to 12 participants. Registration requires permission of the instructor. This lesser-known state park in Long Island City has been many years in the works and offers some of the best views of the NYC skyline, together with wood benches and walkways. Come explore the scenery and photograph park visitors who may be flying kites, fishing, or just enjoying the water views. This well-designed park is a formal industrial site and sits right next to the Pepsi-Cola sign, a reminder of the Pepsi bottling plant that was located very close by. Walking from Kew Gardens, Queens to Midwood, Brooklyn along city streets - approximately 12 miles - is not just healthy for the body, it's healthy for our development as photographers. Along our route we'll get to observe the changing neighborhoods, the varied urbanscape environments of this part of the city, and the people who live and work there. We'll discuss street photography, photographing architecture, how to create an informative and visually stimulating photo essay, and preferred camera settings and lens choices for this type of photo outing. A private lesson with a professional mentor. This is one of the best ways to gain a quicker and better understanding about how your camera works. I've helped students learn how to use a wide range of photo equipment, from simpler compacts to sophisticated DSLRs and assorted film cameras that can do things digitals can't. I don't want you to memorize F-Stops and Shutter Speeds, for instance. I want you to grasp the relationships so that it will all make sense and you'll have more confidence in your photography. My focus is on your gaining control over your camera. But the second part is that I'd like to teach you to see better and create pictures that will impact. We work on composition, using light, exposure, photographing people, locations, and more. Lessons are tailored to your level and specific interests. The streets(and parks) of NYC are our classroom, as well as some landmark buildings. I also work with students who live further away via phone and email consultation. Professional photographers, emerging photographers, and serious photo enthusiasts deserve expert feedback on their work. In the Portfolio Review session you have an opportunity to present 50 to 60 images that you feel represent your visual style and current level of photographic skill - technically and artistically. An overall assessment will be offered as to your strengths as a photographer, as well as those areas that need improvement - along with specific advice to help you focus on photographic goals, and even a specific project you might be working on. Jump-start a personal photo project with valuable peer and mentor critique. Participants meet three times as a group for 1.5 hour sessions and once individually with Judah S. Harris for a one hour consultation about a personal photography project. Personal projects provide a focused, concentrated, and meaningful way to immerse oneself in the photographic medium while exploring a specific subject of interest. They can take weeks or even years and often evolve in unexpected ways. A number of publishing and presentation options will be discussed as part of this seminar, which is limited to 7 participants. $295 per person. Registration requires permission of the instructor.